We got our new gutters. With a bonus new leak over the front door, inside the mudroom-to-be. Now it seems we can pee without getting our feet wet, but we still need an umbrella to get to the toilet. We have new ‘austerity measures’ at home now due the tenants moving out of my house in Fentonbury next month. With them gone we will be broke paying off two mortgages, but I can clean up the place and actually be able to present it to potential buyers as a home I’m proud of. I believe the tenants were a major reason we lost the sale the way we did. I will move back in and keep the house clean, neat, tidy and welcoming and I believe I will find someone who loves it as much as I do. We have a new front door. Or should I say old new front door. I went looking at tip shops this week to find a new door for the mud room. Due to the austerity measures I couldn’t buy a new door cause they’re over $300. Anyway, I wanted a farm door. A door with character. I found one I was sort of happy with for $25 at one tip shop, but it had a plywood veneer and we hate that stuff. Especially for an external door. I figured I could change that but still… Then I saw another, much bigger and totally solid timber door. This one was $60 and was an 1920s deco door. Yeah. That was nicer, and who doesn’t love solid timber. But again, it wasn’t quite right. Not for $60. I’m becoming a cheapscate. Then at the last minute I found my door. It was at the South Hobart tip shop.The front is panelled (which I love) and when I put in 2 glass panes, the windows will give me the light I wanted in the mud room. Best of all, I got it for $20! We’ve put the door on top of the kitchen table I’m meant to be doing up as the door is more important than the table. The plan is to get started on it tomorrow. I wanted to get started today but we decided to make it a tip day. We went for a trip to the tip to get rid of the unsightly pile of rubbish I’d been collecting near the wood shed. Sad when our fun outing for the day was a trip to the tip. At least the tip in New Norfolk has the best views! Then we made a trip up to the bush at the back of our property to get some firewood. This involved gettng into Blue, Wayne’s decrepid old 4×4 which backfires more than it drives giving us whiplash, then, pulling my old trailer behind us, drive out onto the road then up the neighbour’s driveway, up an overgrown old track and through a hole in our fence back onto our land and our own overgrown track. (We haven’t been able to afford to fix our original fix on the ford so we can use our own road to the top of our property). We have plenty of firewood up there. Wayne felled two dead trees yesterday and today I went up to help him chop and load the trailer. Love the great outdoors. 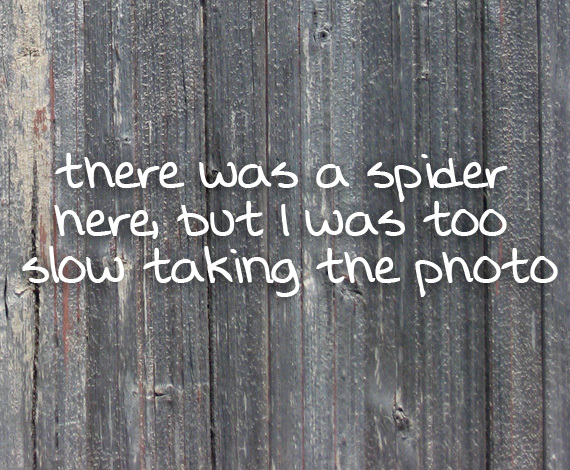 Hate the spiders! I had a huntsman on my shoulder at one stage. I smacked it off, then danced around in the ferns waving my T-shirt over my head screetching like a girl at the top of my lungs. Wayne’s disappointed he missed that. So, having displaced a few huntsmen today, we have a stack of firewood. At least one week’s worth. Now we just have to get another 433 loads to get us through winter. Sure, we left our run a bit late. But its not like we’ve been sitting on our butts, is it? *The porch was a great idea and one inspired by the decision to sell my house in Fentonbury. As things tend to do, this one thing lead to another. (Like my gardening in Melbourne: I trimmed the ivy in the back yard then had to replace the fence when it collapsed once the ivy was removed.) Building has a deck necessitated new gutters. In hindsight, spending money on the deck and enclosing the porch to create a mudroom could have waited till my house was sold… but then I thought I ‘its rented, I’ll sell it, we will manage fine’. Hightsight is a good thing.